There will only be one tone for an emergency or a test. The difference between a test and an actually emergency warning will be the length of time the siren is activated. If an emergency arises you will hear the sound for a minimum of three minutes whereas a test will only sound for a maximum time of one minute. The sound will be a steady tone and is called an alert tone. Exception: In the event of an air or nuclear attack, a different tone will be activated. This tone will have a one-sec/one-sec sweep rate and will not be used for testing or other emergencies. This one-sec/one-sec sweep rate is called the attack tone which means it will change pitch every second. In either case of emergency it is recommended you go inside and listen for instruction from your local television or radio station. A central control computer or encoder, operated by Haltom City Public Safety Communications personnel, sends a secure digital message to each siren, telling the siren to operate. The message is capable of activating one or all sirens by zoning capability. Once the siren receives the message, a motor turns the siren, allowing it to broadcast the warning in all directions. 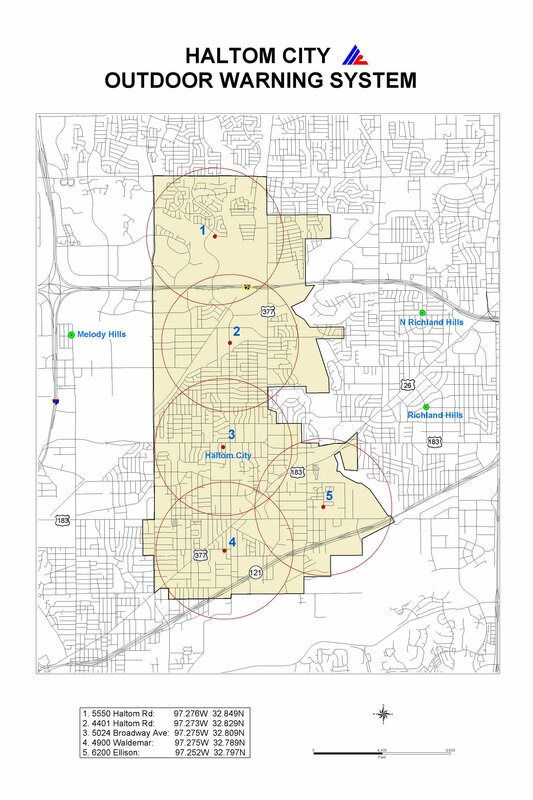 The system in Haltom City is a network of five warning sirens placed on poles fifty feet from the ground surface. These warning sirens are placed in strategically located areas throughout the city. Remain calm and go inside immediately. Turn on your radio or television. NOTE: In this area, WBAP Radio 820 AM is the designated Emergency Alert System (EAS) station. Most other radio and television stations will also broadcast information regarding emergencies. Listen carefully to instruction provided by the EAS station. Take whatever action is necessary to protect yourself and your family. -Stay inside unless you receive information that contradicts staying inside. It is almost always safer to stay inside until the emergency has ended. Please do not call 911 unless you must report a life-threatening situation. Keep blankets, water, food (non-perishable), flashlight, personal hygiene items, necessary medications, portable radio and spare batteries readily accessible. Have your driver’s license, checkbook, cash and credit cards with you. Always keep at least a half tank of fuel in your vehicle at all times. If you have a cellular telephone, keep it charged and accessible for these emergencies. On April 1st, 2010, Mark Fox, of the National Weather Service, presented Haltom City Emergency Management Coordinator Perry Bynum and Mayor Bill Langford with the StormReady Community Designation. Haltom City is one of sixty seven communities in Texas that have received the StormReady designation. There are three steps to becoming StormReady: written application, verification visit(s), and local board action. Applicants with jurisdiction over a community and unincorporated areas of the surrounding county need only submit one application with the combined populations. The application requests a basic accounting of emergency technology and a brief narrative describing preparedness and planning activities. The narrative aids in assessing such things as the hazardous weather plan, exercises and public safety programs. After reviewing the application, the StormReady Chairperson will assign a team to visit the applicant and formally discuss the application. StormReady communities are better prepared to save lives from the onslaught of severe weather through advanced planning, education and awareness. No community is storm proof, but StormReady can help communities save lives. This program educates people about disaster preparedness for hazards that may impact their area and trains them in basic disaster response skills, such as fire safety, light search, rescue, team organization and disaster medical operations.